Recently a friend in Houston boasted about the breadth and depth of her city's restaurant scene, and I said that I thought Houston could easily compete with Boston on that score. Her eyebrows shot upwards: "Boston? Where would you eat in Boston?" Technology Square is a new hot spot, not just for the macro-nerds at MIT but for the businesses that have grown up around it, and everyone needs good places to eat and drink. These include Area Four, Bondir, and the newest, Catalyst, a large, expansive mix of minimalist modernism and evocations of New England farm décor. 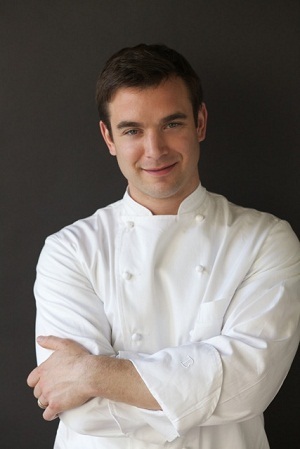 Chef/owner William Koval is doing equally balanced American cuisine with a distinct nod to the seasonal, so the menu changes often. In summer and early autumn, the al fresco patio is the place to dine. When I ate there, the menu of 20 items showed off the range of New England's bounty, from garden to sea, from lakes to forest, starting with juicy, meaty crispy quail with black Mission fig, mizuna greens, and, a sweet-acidic gastrique that cut the richness of the dish. The Jerusalem artichoke (so named not because it came from Jerusalem--it's an American vegetable--but because in Italy it was called girasole ["turns to the sun"], which got mis-translated into English as Jerusalem artichoke) was made into a creamy but light soup with a good portion of lobster and a dash of curry oil to evoke Boston's historic spice trade. Two pastas were first-rate: Very sweet Georgia squash filled tortellini, served alongside braised escarole and shavings of Parmigiano. Mushroom ravioli (right) included hen of the woods along with a reduction of Madeira wine and garlic-rich aïoli. Entrees that night were a little less impressive than the starters, but there was a great deal to like about the burger on a brioche bun, with bacon, Cheddar cheese, caramelized onions, roasted tomato, housemade ketchup, mustard and aïoli--a tour de force of good hearty tastes. Lemon sole was scented with roasted fennel, and the creamed leeks were a welcome enrichment along with a bit of lobster and vermouth-laced butter. Koval (left) spit-roasts his chicken, giving it a perfect golden crisp skin all over, and he serves it with chanterelles, green beans, bacon, pearl onions, a little thyme, and potatoes to soak up the chicken drippings. He glazes a thick Berkshire pork chop with cider then buoys it with mustard-flavored spätzle, sauerkraut and a Courtland apple puree--a dish that reminds you that sauerkraut and apples, along with cider, are the perfect complements to pork. The French fries here are well worth the extra six bucks. This summer, the desserts include butterscotch and passion fruit pudding with warm pound cake croutons; chocolate fondant, caramel glaze, hazelnut streusel and banana coulis; and a vanilla Coke float with braised cherries and peppermint. 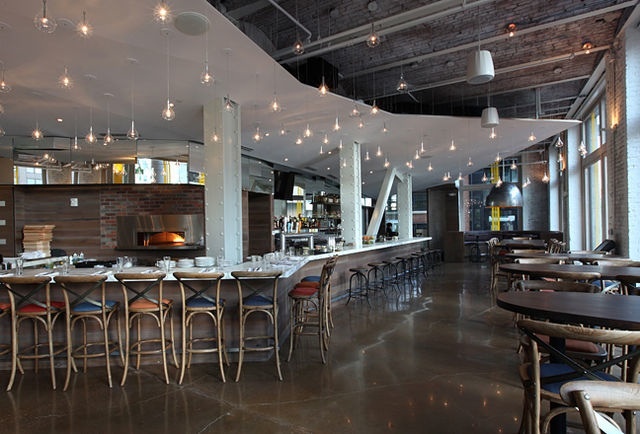 Catalyst is open for lunch and dinner. Dinner starters $9-$15, main courses $15-$27. 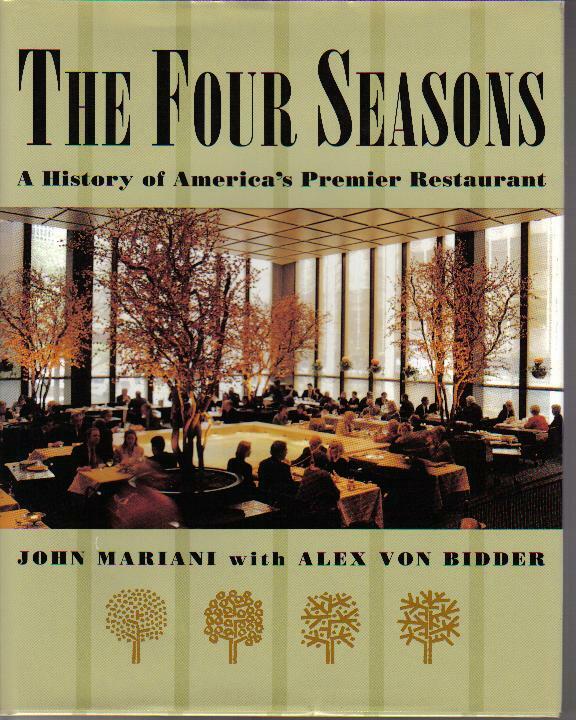 Over the last three decades, the dining options at The Four Seasons, whose main restaurant used to be called Aujourd'hui, has gone through plenty of changes of décor, style and chefs. Right now it is called the Bristol Lounge, and they have hit upon what I think is the right balance of the casual and the sophisticated, and, under exec chef Brooke Vosika, the menu reflects an ideal combination of superb New England and global cuisines within an amiable dining room set against the sunny backdrop of the Boston Commons in full bloom right now. 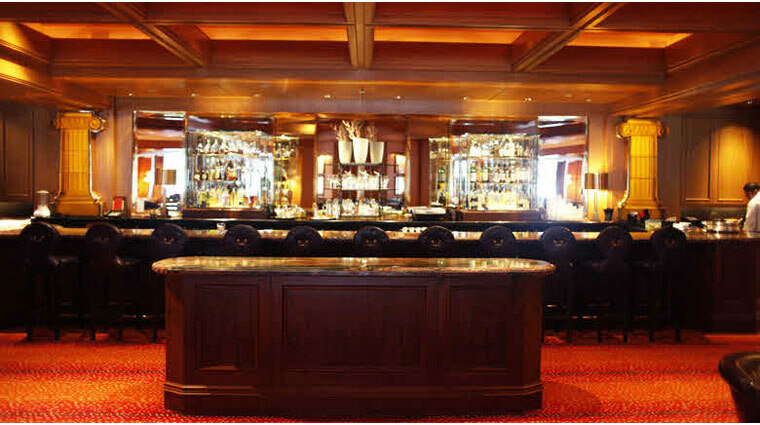 The restaurant is also known for having the most lavish Sunday brunch in the city. My wife and I were there for a Saturday lunch, and from first course through dessert we were impressed with the fresh ideas and impeccable ingredients used here. Lunch is also a good time to go because prices are somewhat cheaper. 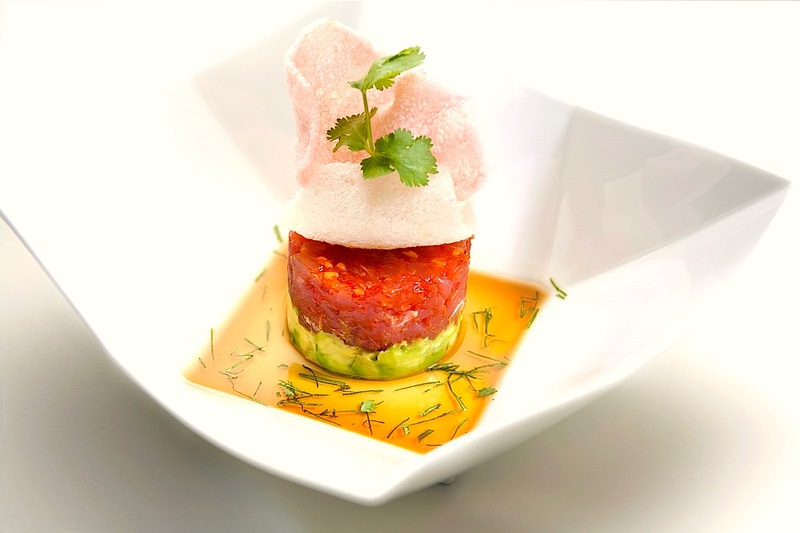 Our first bite of ahi tuna tartare (left) with avocado, crisp rice noodles, and toasted peanuts told us all we needed to know about how executive sous-chef Jose Gamez captures his flavors and binds them into one glorious whole. The tuna was of superb quality, the avocado soft and sweet, the noodles added Asian texture, and the peanuts another. Three onion soup was laced with apple brandy and decadently thick with excellent Gruyère cheese, the onions themselves the color and sweetness of true caramel. A mushroom tamale with chanterelles came with a mild salsa and almond puree. This is Boston, so the lobster roll is ubiquitous. The Bristol's, at $30, justifies itself by being as chock full of lobster meat as a triple-decker sandwich is with turkey and bacon, and it is treated to a tangy lemon sabayon instead of the usual mayonnaise, served on a garlic-scented bun and with sweet potato fries that go perfectly. We also enjoyed seared diver scallops, just past translucence, sweet and fat from cold Atlantic waters, and it came in a defiantly New England corn and clam chowder with marble potatoes and prosciutto chips. It was a terrific lunch and would have made just as fine a dinner. 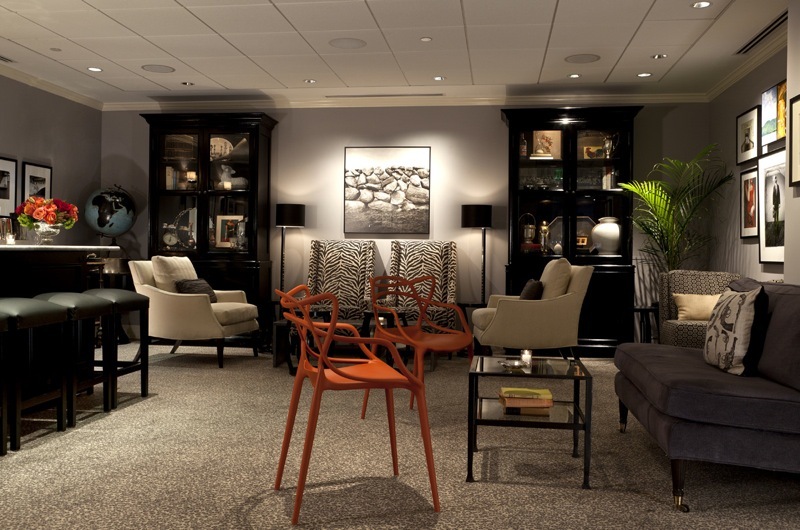 At a time when so many Boston restaurants have completely shed their more civilized amenities, The Bristol Lounge is a reminder of just how far refinement without pretension will and should go. The Bristol Lounge is open for breakfast, lunch and dinner. At lunch starters run $12-$20, sandwiches $20-$30, main courses $27-$39. 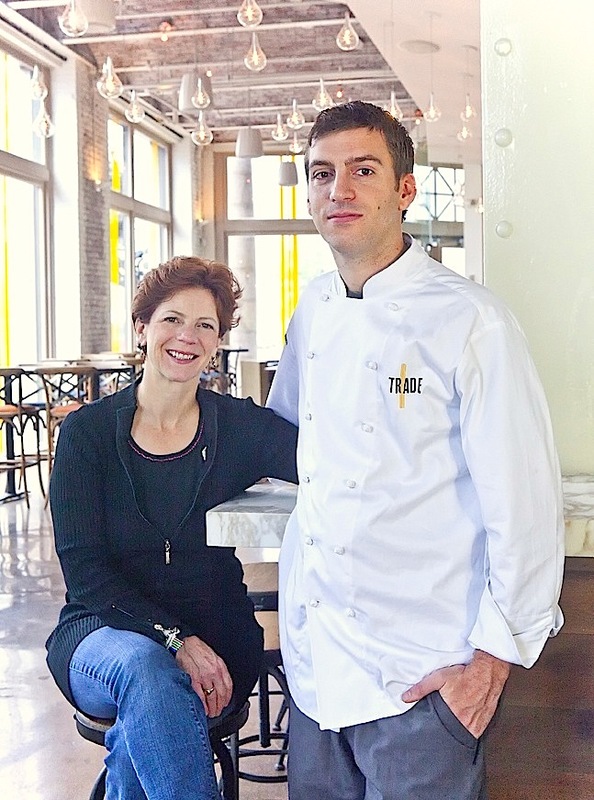 Few chefs in New England have the enduring respect of her colleagues as does Jody Adams, known for her wonderful Italian restaurant Rialto in Cambridge. 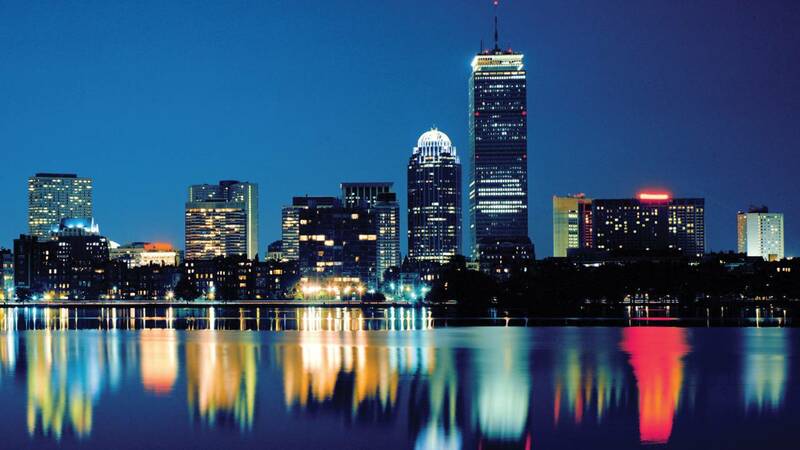 Now, downtown, she has has provided Boston with a big, sprawling, bustling place specializing in small plates with a Mediterranean slant, and a counter/bar and communal table that’s become very popular everyday and night of the week. 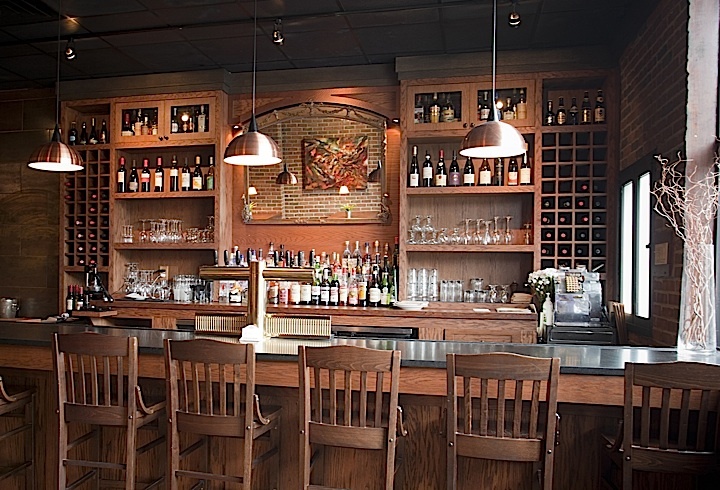 TRADE has one of Boston’s best-value global wine lists, with bottles chosen to go with the spicy food here. The menu is huge and so is the dining room, and the kitchen crew, headed by exec chef Andrew Hebert (below, with Adams), is not large, so not everything that comes out of that kitchen has the same degree of finesse. 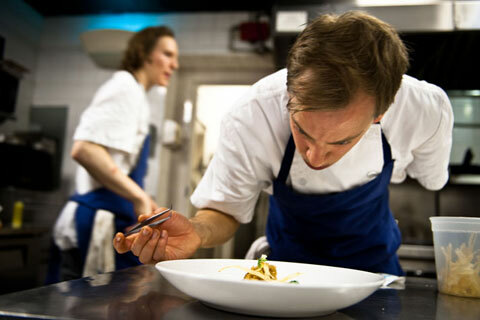 Some dishes taste somewhat flat, others needed a little extra time to bring into focus. But there are so many tasty options here that you can pretty much point your finger anywhere, order a mess of small plates--which range from $8-$12--and do just fine. You're very likely to love the lamb sausage flatbread with eggplant puree, Manchego cheese, peppers and yogurt. That goes, too, for local burrata with almonds, dates and balsamic; pomegranate-glazed eggplant with capers, olives and pine nuts; and spicy head-on shrimp with piri piri peppers. Day boat scallop ceviche with yuzu, favas and cucumbers was mild. There is a selection of five flatbreads at Trade, including ones with rosemary, ricotta salata and sea salt and a good rendering with mushrooms and figs with Gorgonzola, sage pesto and walnuts. You might also consider the section "A Little Extra" of small plates, and the roasted cauliflower with curry, raisins and cilantro; roasted asparagus with romesco, aleppo and chervil; and crispy potatoes with paprika and cumin will go fast at any table. The larger plates run from a good whole roasted trout with a canny assemblage of grilled pineapple, sweet plantains and coriander, and there's a lot to like about the braised short rib with sunchokes, oranges and olives. Surprisingly, baked rigatoni with spicy lamb ragù and provolone wasn't much out of the ordinary from what you might find in Boston's Little Italy eateries. Pastry Chef Sarah Cravedi has a nimble way with desserts like chocolate budino with sea salt, rosemary and hazelnut wafer, and a terrific honey-roasted crostada of ripe pears with crème fraîche and caramel. TRADE has been a very big hit early on, and I hope that management can manage to get the flow and the consistency right, meaning they might take fewer customers at peak periods. 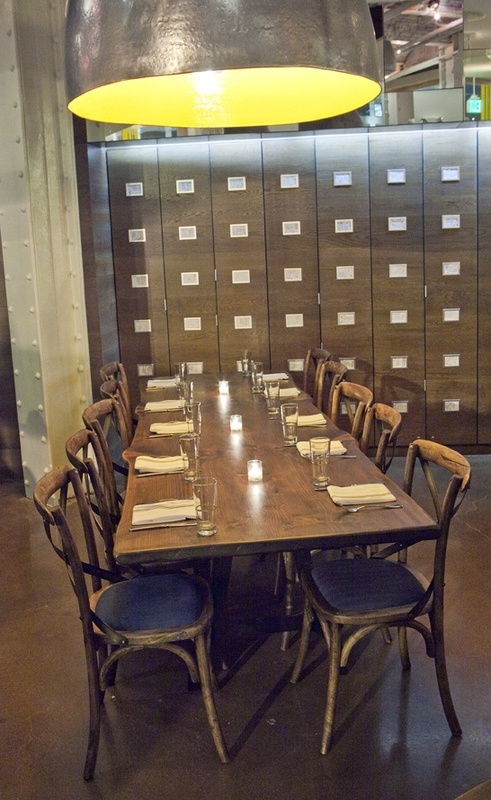 Trade is open for lunch and dinner Mon.-Fri, for dinner Sat. & Sun. Small plates $8-$16, large plates $16-$31. 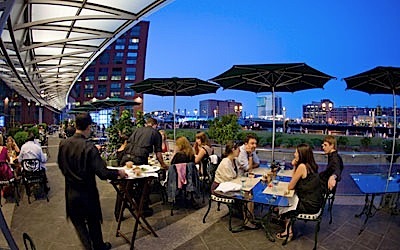 Boston's waterfront is nowhere better appreciated than from a table at Miel Brasserie in the five-year-old InterContinental Hotel, located on the site where the Boston Tea Party took place in 1773 (a brand new Museum celebrating the event has just opened there). In fact, the hotel is offering a Boston Tea Party Experience package from now through December at $329 a night for a deluxe room and museum tickets, among other amenities. The hotel is also ideally located within steps of the Boston Children's Museum, the new developments at Five Point Channel, and most of the other historic sites along the waterfront. The hotel's spacious rooms are extremely well situated and the glass walls throughout give them several panoramas from different angles. There is also a pool and 6,600-square foot spa here. There are actually three restaurants at the hotel: the bright and colorful Sushi Teq, whose name references its emphasis on Japanese sushi and Mexican tequilas (with salsa dancing encouraged); RumBa, a circular bar, with a hidden Champagne Lounge within mahogany walls, that stocks more than 100 rums from around the world and offers a raw bar of appetizers throughout the day. Miel Brasserie is for breakfast, lunch and dinner, and at midday my wife and I, having walked our feet off that morning, were happy to sit behind the wall of glass and stare out at the sunny waterfront (had it been warmer we would have been outside on the deck) and put ourselves in the hands of Chef Devanand Chinta, a Frenchman well schooled in all the classics of Provençal cuisine, here based on the New England cornucopia, which includes the hotel's own apiary on the roof (the honey is excellent, indeed). The wine list is solid and of particular interest to those who enjoy rosé wines. Adjacent to Miel (which means "honey") there is also an olive oil museum, reflecting further on the link between the menu and Provence. In fact, the cooking here involves no butter at all, which I think doctrinaire, but we really didn't miss it in the food. There some perfectly prepared old favorites here, not least the croque monsieur sandwich, made with thick brioche bread sandwiching an ooze of Mornay sauce and incredibly rich Saint André cheese, with a sunny side up egg on top--two could share this with a glass of wine for lunch. Root vegetables are roasted in honey and served with prosciutto, olive tapenade, and basted egg, while a crêpe jambon et fromage was lavished with béchamel over honey ham, Swiss cheese and hearty short rib hash and baby arugula. What's not to love about baked sweet potato and lobster with mushrooms. onion and a blast of cayenne in the crust? Or a mac and cheese crockpot with truffle peel, Gruyère and fontina cheese? For something a tad lighter, there is very finely grained pan-seared tuna Mentonaise with potatoes in olive oil, pesto, and hard-boiled eggs. For desserts, you may lighten up still further with a cup of summer berries or throw caution to the wind and go for the delicious crêpe with Nutella chocolate and sautéed bananas. Then sit back, take in the waterfront sunshine and life, and prepare for a good long walk till sundown. 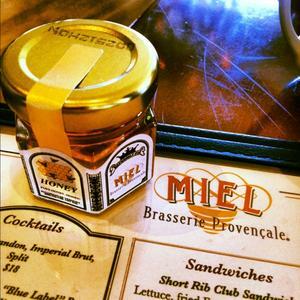 Miel is open for lunch and dinner daily, with brunch on Sat. & Sun.Lunch appetizers run $8-$16, entrees $12-$16. The Hawthorne, adjacent to the Commonwealth Hotel (500A Commonwealth) and happily just up the street from Fenway Park, has won justified popularity for its swank main bar and its rear room, much quieter, with cushions on couches and zebra-fabric sofas, dazzling modern photography, and a small bar making signature cocktails. You can actually rent the room out by the hour for a private cocktail party. The finger food is some of the best in Boston, too. Before or after a Sox game, this is the perfect place to roar or rave, but keep it down a bit in the rear room. The restaurant scene in Brooklyn grows more enticing by the month, and, depending on the number of subway stops people from other boroughs need to make, many of them are well worth the effort to get to them, especially if they are as accommodating as the new Gwynnett Street, a name formerly given to what is now Lorimer Street in Old Williamsburg. 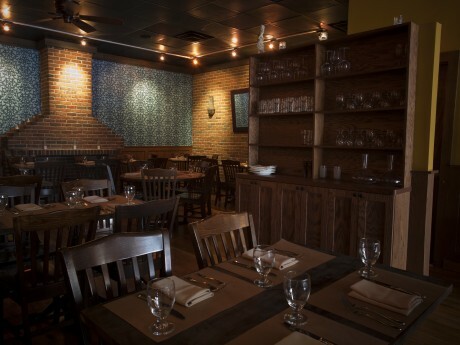 In its look, the restaurant has much the same decorous style as a number of other Brooklyn newcomers, dependent on warm red brick as a background to an L-shaped dining room with a tidy bar up front. The greeting, by owner Carl McCoy (below), couldn’t be more gracious, consistent with all the staff here. The menu is short, as it should be in a restaurant of this size and ambition, but the food at Gwynnett St. is very much out of the ordinary from the gastropub clichés you find so much of in NYC’s largest borough. Missouri-born, McCoy garnered his love of food from his Sicilian grandfather and trips throughout Europe. 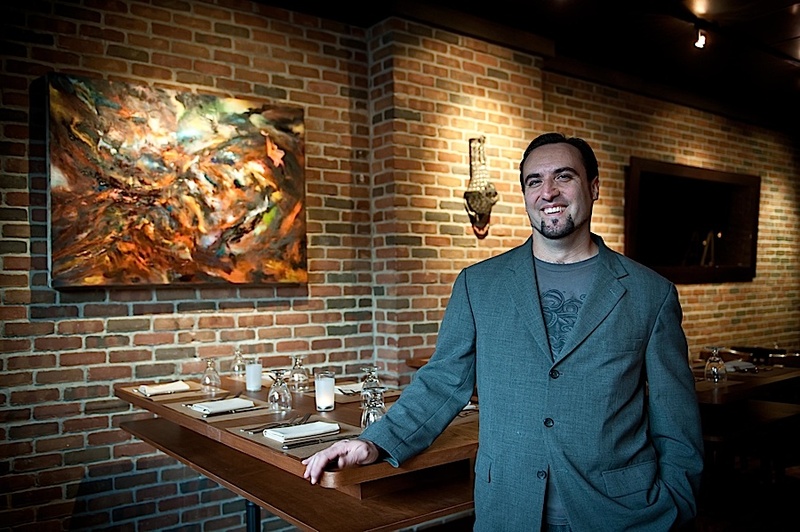 After working at others' restaurants in Philly, McCoy moved to NYC, where he became wine director at Esca, and now, his own dream has been realized at Gwynnett St. His chef is Justin Hilbert (below), whose résumé includes stints on the Isle of Wight, Mugaritz in Spain and WD-50 in Manhattan; Owen Clark is sous-chef, and the bar manager is Brooklyn native Doug Mancini, who offers a slew of signature cocktails with punning names like Kingston Trio, Thick as Thieves, and Rye Thai. The dinner menu lists seven starters and six entrees, with nightly specials. There is a tasting menu at a very reasonable $85, with wines $110. The first item on the appetizer list is a little off-putting: whiskey bread and cultured butter, which is sensationally delicious, but it'll cost you five bucks, and no other bread is offered. (Yeah, but it's worth it.) A soy bean and pistachio soup with rhubarb and butter is an ideal summer savory, each element in balance with the rest. "Pea Shoots and Leaves" is an equally delightful mélange of snap peas, radishes, curds and whey, so homey you want to keep repeating its name and ingredients like a nursery rhyme. Calf's tongue, so hard to find on menus, is velvety and full of flavor, served with summer's beans, cucumber and watercress. There seems a touch of the much ballyhooed new forage-driven Nordic cuisine here, although no one really knows just what that is. Given the simple goodness of Hilbert's dishes, our table of three was torn over whether to order an Amish chicken with buttermilk and ash, or a duck breast with wild rice, bell pepper and gooseberries. We chose the latter and found it absolutely perfect in its idea and resolution: the duck breast was cooked to medium rare, the skin crisp, and the addition of the rice (though I think they might spare a few more grains on the plate), the sweet pepper and juicy berries was a triumph. On the same par was a plate of perfect scallops (which can can be pretty boring if not in peak seasonal sweetness) served with bright zucchini, sorrel and the surprise of sweet blue crab. A bavette steak (right) had just the right chewiness this underutilized cut should have, and it was enriched with bone marrow and alliums, that is, onion and garlic shoots and bulbs to add a bouquet and sharp flavor. Gwynnett St.'s desserts keep impeccably to the style of what goes before them: cherry sorbet with foam and candied cherries and coffee sponge cake with almond toffee coffee sauce; milk chocolate ganache with peanut butter crumble praline and foam, candied black currants and black currant sorbet; and cashew cream with apricot sorbet, and a meringue (odd, really) of birch bark and granules. Gwynnett St.'s wine list is printed on one page, so every bottle is carefully chosen to go with Hilbert's food, and the staff cheerfully encourages you to sample a glass for under $10. Otherwise, there are many bottle options under $50. What I enjoyed was a decidedly summer menu, and it makes me wonder what autumnal enchantments await. Restaurants in Brooklyn have found it easy enough to be lovable, but Gwynnett St. is doing distinguished food without a whit of pretense and at prices that make a trip out there well worth it. Gwynnett Street is open for dinner nightly. Appetizers run $5-$16; entrees $20-$29. It’s a pretty easy claim to make that the best white burgundies and Champagnes are France’s finest dry white wines. But I will take a stand and say that the white wine that deserves the bronze medal is Sancerre, the enchanting sauvignon blanc-based glory of the Loire Valley. If that comes as a surprise to those devotees of Alsatian rieslings and Rhône Valley viogniers, I will vigorously argue my point with you over a glass of each. But for me, good Sancerre—and there is a lot of bad Sancerre—gives me a greater degree of sheer happiness than the rest of those fine white bottlings, and, unlike them, Sancerre can be drunk with just about anything shy of charcoal-grilled steak or lamb. With any seafood, Sancerre’s brisk, vegetal and mineral flavors marry impeccably. 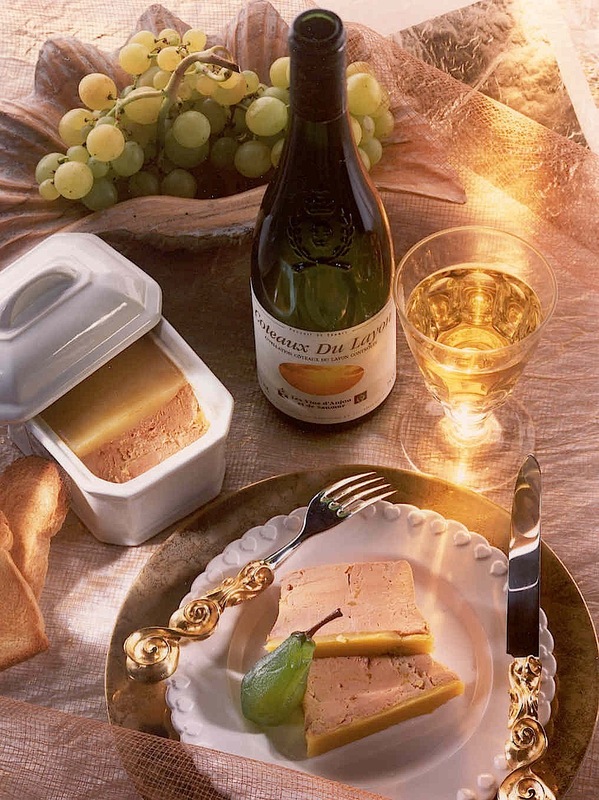 With most appetizers, even foie gras, it is a worthy complement. With chicken, there are few wines to match it. And as an aperitif before dinner, it’s a wine that perks up the appetite and may be carried to the dinner table with ease. This is certainly not the case with sauvignon blancs in most other parts of the world, especially New Zealand, where the varietal is a major export, and California and Oregon examples range so widely in style that they are hard to say anything definitive. Good Sancerre has the fruit most people love in a white wine, the acid to keep it bright and fresh, the minerals to give it complexity, and the price to make it affordable for just about any size gathering. 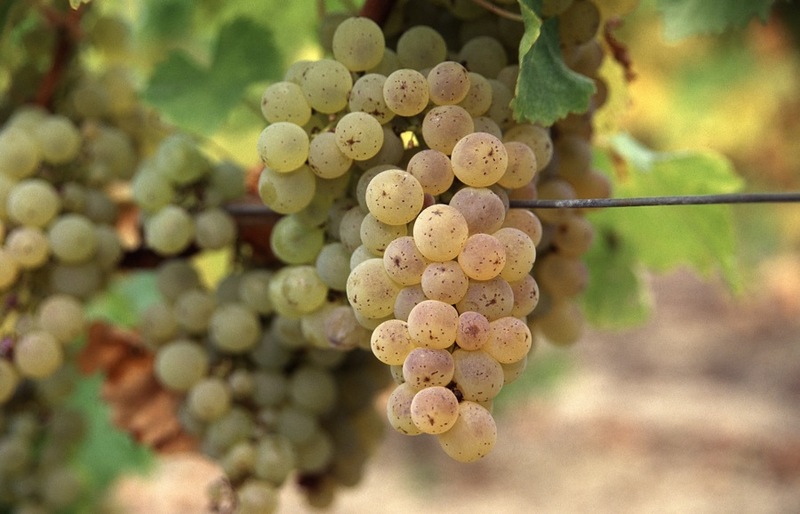 Traditionally, Sancerre was vinified bone dry, buoyed by the minerality and herbaceous flavors, but in the last decade, with global warming in play, the wines have taken on more fruitiness from increased sugars. Still their alcohol by volume is rarely much above 13 percent. The Valley also produces red and rose Sancerres but they are typically modest wines. Domaine Fournier Sancerre “Cuvée Silex” 2008 ($40)— Between them, Éliane and Claude Fournier share 13 generations of viniculture, and, with 150 acres of vineyards, tradition and expertise show. Can Sancerre age well? This four-year old vintage proves it can when made by Fournier. Its elements are subtle, but they add up to a wine that is French sunshine in a glass, with beautiful color and nose, and long-lasting on the palate. Domaine Fournier Père & Fils Grande Cuvée Vielles Vignes 2008 ($27)–This “old vines” Sancerre shares the Cuvée Silex’s richness and adds to it. They cool down the must before fermentation and let it sit on the lees for half a day to impart richness. It is in impeccable shape right now and makes for a fine wine with creamy cheeses like Camembert and Brie. Domaine Fournier Sancerre “Les Belles Vignes” 2010 ($20-$23)— Fourier’s bargain Sancerre—made from 15 to 20 year old vines--a splendid mix of flinty minerals and lush fruit, a wine ideal for chicken dishes and wild salmon. Pascal Jolivet Sancerre 2010 ($16-22)—For a winery only founded in 1987, Pascal Jolivet makes enchanting, very versatile Sancerre from an ideal soil mixture of 50 percent limestone, 30 percent chalky clay, and 20 percent flint, all of which give it a fresh, spicy nose and green spring flavors like new grass. It’s always sold at a very decent price, too. Picard Sancerre 2010 ($20-$22)—Since the 17th century the Picard family has made wines in the Loire Valley, and they continue to produce a limited amount of wine of which their Sancerre is an elegant example, with light ginger notes. Baron de Ladoucette Sancerre “Comte Lafond” 2010 ($28-$36)—Long a champion of the modern style in the Loire, the estate’s Sancerres are known for their well-knit spices and acids, along with flowery bouquet and long finish at the back of the palate. With shellfish, it is superb. His Château de Nozet is shown in the photo at right. Clos de la Poussie 2010 ($32)—If you like bone dry wine of the old school, this is your Sancerre. The vineyards were until recently in terrible shape, when this vintage was produced, but now appear to be much healthier. I found the wine’s only virtue was its crisp, citrusy acids but beyond that its dryness was merely bland. Domaine Thomas Sancerre La Crele 2010 ($25)—Its very pale color may fool you, for this is a big, full-fruited wine, made from old vines, with 13.5 percent alcohol. It’s what they should be aiming for in New Zealand and California, and if you like that style, try this for a lot more finesse. Foucher-Lebrun Sancerre Le Mont 2010 ($15)—What a bargain for a bold, floral example of Sancerre from a small producer, with a perfect balance of fruit and acid and a refreshingly dry finish. John Mariani's wine column appears in Bloomberg Muse News, from which this story was adapted. Bloomberg News covers Culture from art, books, and theater to wine, travel, and food on a daily basis. 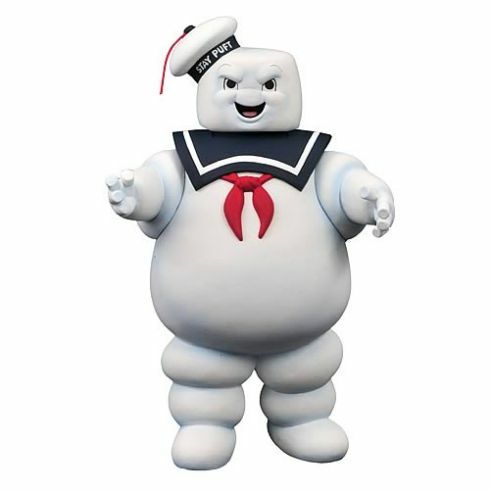 ANNALS OF THE ELITE FRENCH POLICE-- SARTRE SAYS, 'EAT THIS!" “Jean-Paul] Sartre (right) was a straight-out fellow traveler with the P.C.F., the Parti Comministe Français, and Albert Camus was not. 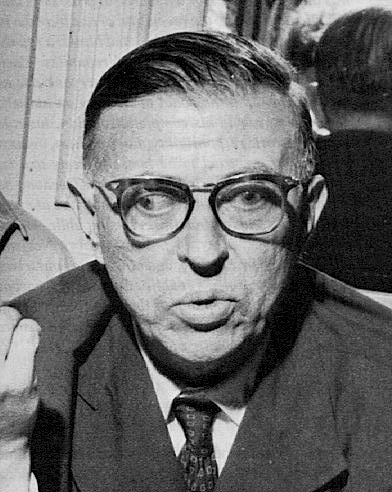 Sartre was outraged on behalf of the Party by such episodes as the `affair of the carrier pigeons,’ in which the Party Secretary was found with pigeons in his car and was accused by the police of using them, like a good revolutionary, to coordinate illegal demonstrations. 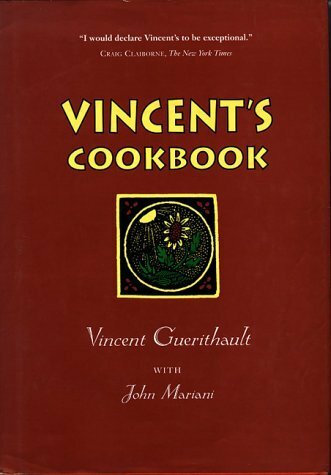 (It turned out that, like a good Frenchman, he was merely planning a squab casserole. )”—Adam Gopnick, “Facing History,” The New Yorker (4/9). ZILLIONS OF LONE STAR TICKS! Dr. Scott Commins of the U. of Virginia has linked the bite of the lone star tick to the sudden onset of severe meat allergies. 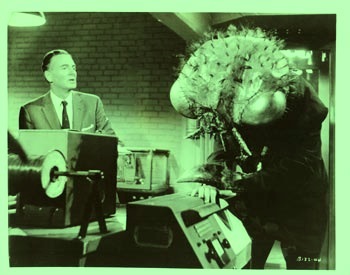 His research suggests that people break out in hives a few hours after eating meat. 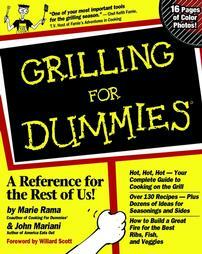 Any of John Mariani's books below may be ordered from amazon.com. 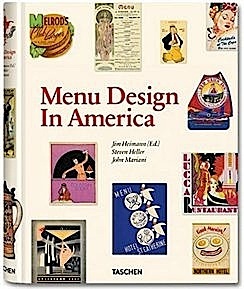 My latest book, which just won the prize for best book from International Gourmand, written with Jim Heimann and Steven Heller, Menu Design in America, 1850-1985 (Taschen Books), has just appeared, with nearly 1,000 beautiful, historic, hilarious, sometimes shocking menus dating back to before the Civil War and going through the Gilded Age, the Jazz Age, the Depression, the nightclub era of the 1930s and 1940s, the Space Age era, and the age when menus were a form of advertising in innovative explosions of color and modern design. 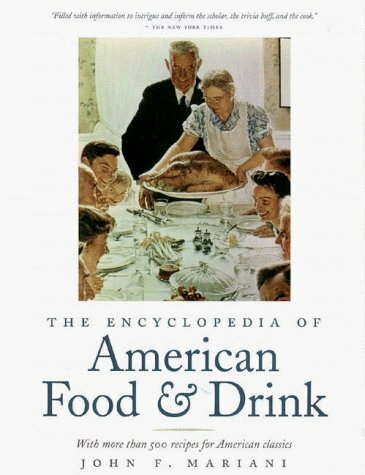 The book is a chronicle of changing tastes and mores and says as much about America as about its food and drink. 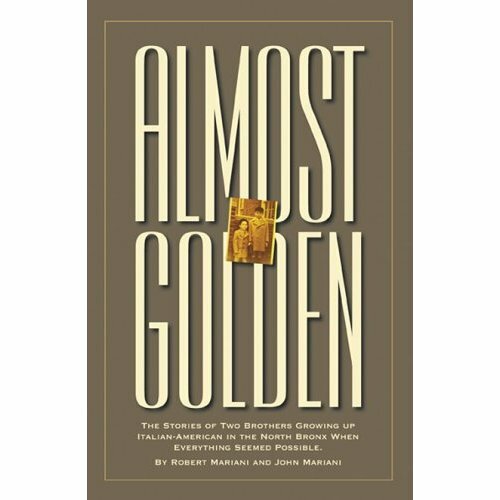 “Luxuriating vicariously in the pleasures of this book. . . you can’t help but become hungry. . .for the food of course, but also for something more: the bygone days of our country’s splendidly rich and complex past. Epicureans of both good food and artful design will do well to make it their coffee table’s main course.”—Chip Kidd, Wall Street Journal. “[The menus] reflect the amazing craftsmanship that many restaurants applied to their bills of fare, and suggest that today’s restaurateurs could learn a lot from their predecessors.”—Rebecca Marx, The Village Voice. 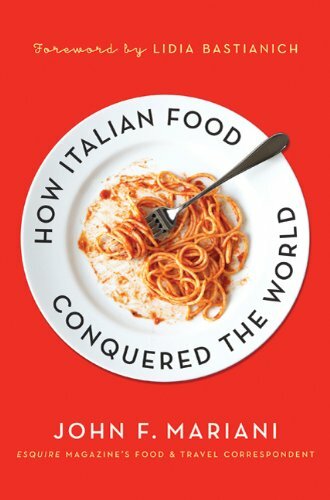 "Eating Italian will never be the same after reading John Mariani's entertaining and savory gastronomical history of the cuisine of Italy and how it won over appetites worldwide. . . . This book is such a tasteful narrative that it will literally make you hungry for Italian food and arouse your appetite for gastronomical history." --Don Oldenburg, USA Today. 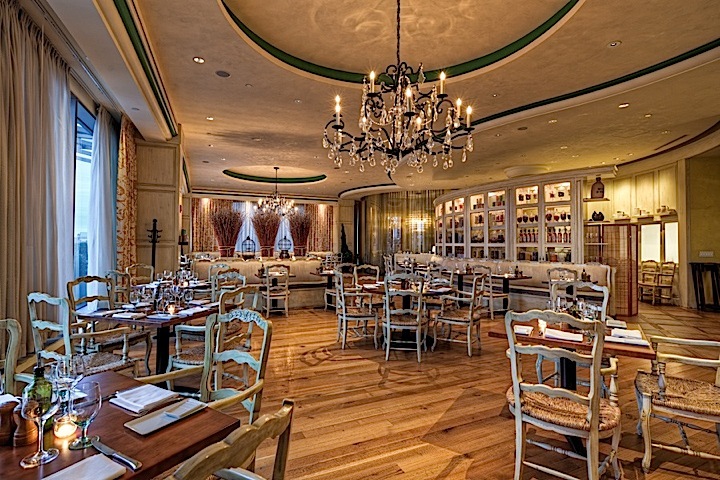 "Italian restaurants--some good, some glitzy--far outnumber their French rivals. Many of these establishments are zestfully described in How Italian Food Conquered the World, an entertaining and fact-filled chronicle by food-and-wine correspondent John F. Mariani." --Aram Bakshian Jr., Wall Street Journal. "Equal parts history, sociology, gastronomy, and just plain fun, How Italian Food Conquered the World tells the captivating and delicious story of the (let's face it) everybody's favorite cuisine with clarity, verve and more than one surprise." --Colman Andrews, editorial director of The Daily Meal.com. 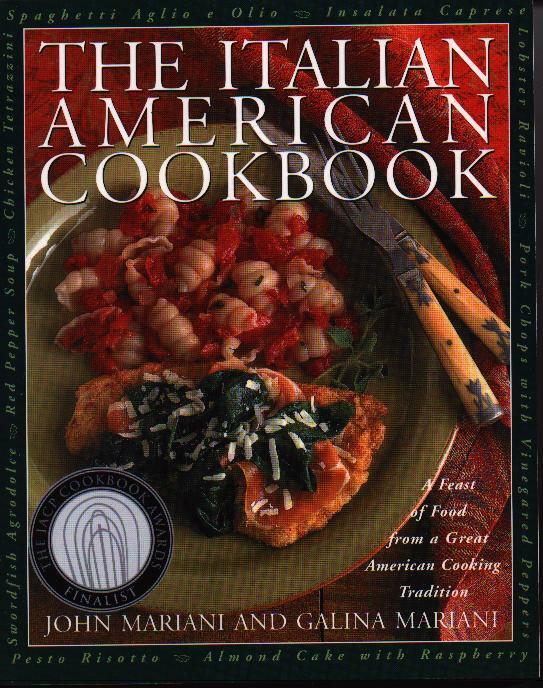 "A fantastic and fascinating read, covering everything from the influence of Venice's spice trade to the impact of Italian immigrants in America and the evolution of alta cucina. 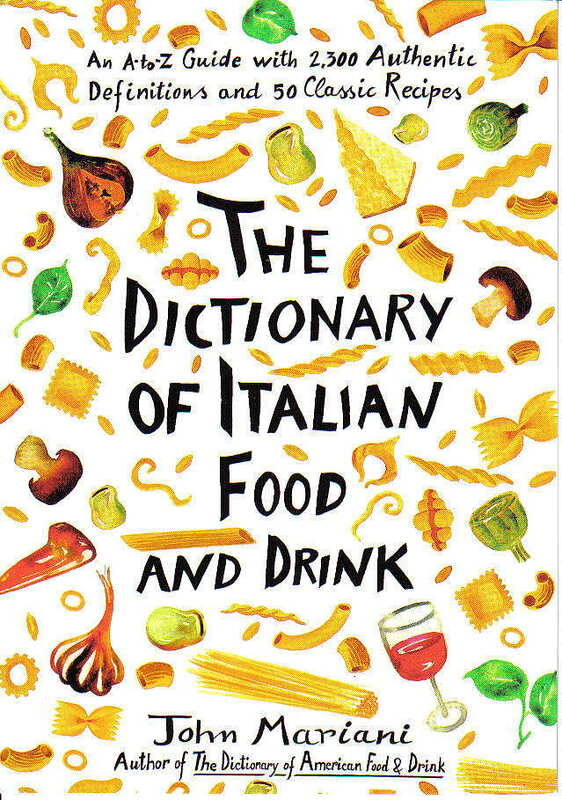 This book will serve as a terrific resource to anyone interested in the real story of Italian food." --Mary Ann Esposito, host of PBS-TV's Ciao Italia. 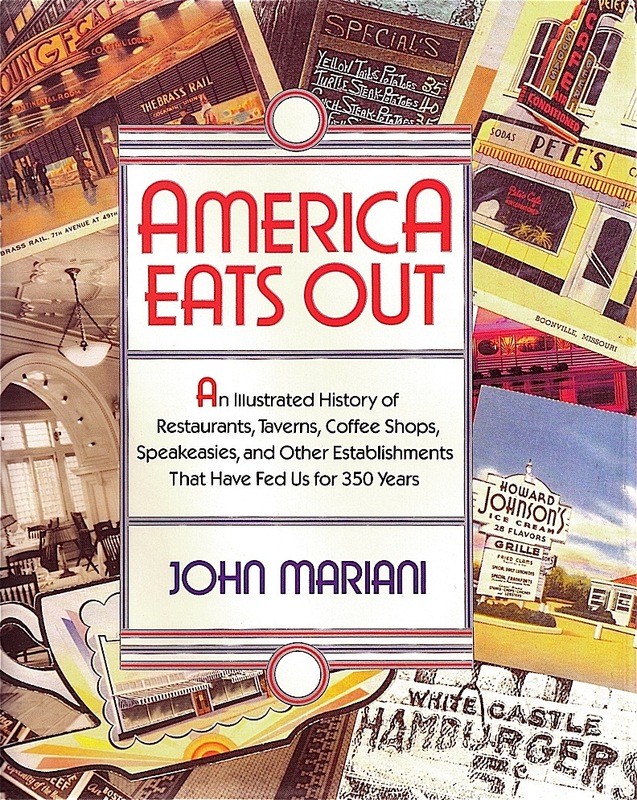 "John Mariani has written the definitive history of how Italians won their way into our hearts, minds, and stomachs. It's a story of pleasure over pomp and taste over technique." --Danny Meyer, owner of NYC restaurants Union Square Cafe, Gotham Bar & Grill, The Modern, and Maialino. 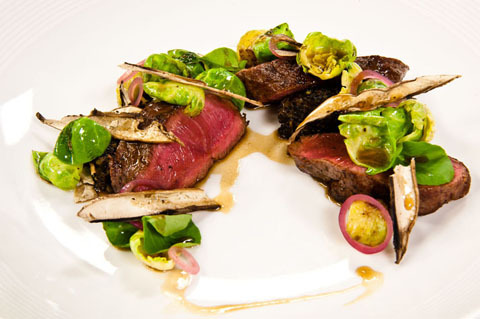 Eating Las Vegas is the new on-line site for Virtual Gourmet contributor John A. Curtas., who since 1995 has been commenting on the Las Vegas food scene and reviewing restaurants for Nevada Public Radio. 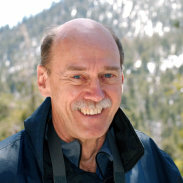 He is also the restaurant critic for KLAS TV, Channel 8 in Las Vegas, and his past reviews can be accessed at KNPR.org. Click on the logo below to go directly to his site. Tennis Resorts Online: A Critical Guide to the World's Best Tennis Resorts and Tennis Camps, published by ROGER COX, who has spent more than two decades writing about tennis travel, including a 17-year stretch for Tennis magazine. 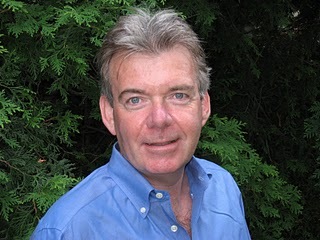 He has also written for Arthur Frommer's Budget Travel, New York Magazine, Travel & Leisure, Esquire, Money, USTA Magazine, Men's Journal, and The Robb Report. He has authored two books-The World's Best Tennis Vacations (Stephen Greene Press/Viking Penguin, 1990) and The Best Places to Stay in the Rockies (Houghton Mifflin, 1992 & 1994), and the Melbourne (Australia) chapter to the Wall Street Journal Business Guide to Cities of the Pacific Rim (Fodor's Travel Guides, 1991). nickonwine: An engaging, interactive wine column by Nick Passmore, Artisanal Editor, Four Seasons Magazine; Wine Columnist, BusinessWeek.com; nick@nickonwine.com; www.nickonwine.com. 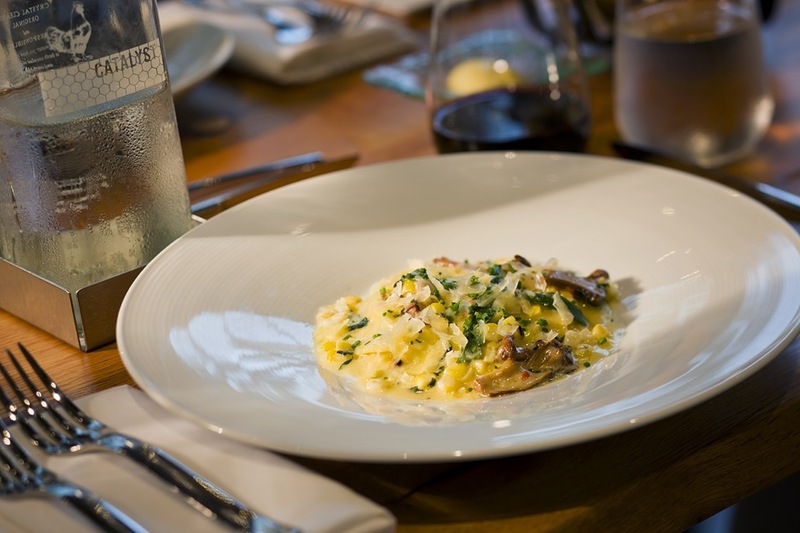 MARIANI'S VIRTUAL GOURMET NEWSLETTER is published weekly. Editor/Publisher: John Mariani. Contributing Writers: Christopher Mariani, Robert Mariani, John A. Curtas, Edward Brivio, Mort Hochstein, Suzanne Wright, and Brian Freedman. Contributing Photographers: Galina Stepanoff-Dargery, Bobby Pirillo. Technical Advisor: Gerry McLoughlin. To un-subscribe from this newsletter,click here.